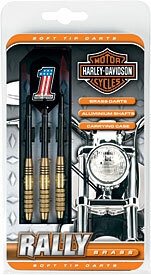 These Harley Darts are Great for the Beginner. The Harley Logo-Engraved Brass barrels make for a good lookin set of arrows. Pocket Carry Case included.